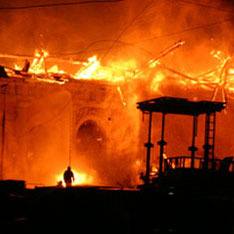 Terrible fire broke out Sunday night by Kremlin walls. A historic building in the downtown Moscow was caught on fire. News of fire at Mokhovaya Street 18 has been first reported at 9:00 pm Moscow time. Firemen discovered open fire on the roof. More than 5 000 sq meters was caught on fire. Increasing wind contributed to rapid spread of fire. The historical building “Manezh” could hardly be seen from the side of Okhotny Ryad due the dense smoke. The glow could be seen from several kilometers from the epicenter. The fire was categorized as severe and was attributed fifth category. Nearby buildings on the Mokhovaya Street were also partially damaged. In addition, entrance to the nearby underground shopping mall “Okhotny Ryad” was also in flames. Traffic was temporally blocked while a team of firefighters attempted to get closer to the building. Chief of the state fire fighting services of Moscow, colonel, Victor Klimkin headed the operation. Sergey Shoiugu also arrived to the scene. A helicopter was used in a tedious battle with the fire. According to the latest information, the buildings roof has fully collapsed. By 11:00 pm, it was virtually impossible to save the historic monument. Only bare walls survived. In the beginning, it was assumed that short circuit in one of the furniture offices caused the fire. Another version however suggests that the epicenter was somewhere on the roof. The information was provided by Mayor of Moscow Yuri Luzhkov. He fully excluded a version of the terrorist act as well as that of arson. Two firefighters were killed and two were injured in an attempt to extinguish the fire. The fire was liquidated by 2 o'clock in the morning MSK.